During our hours of testing the G35 northbridge cooler ran at 50°C and the southbridge was even hotter, at 55°C. This isn’t the sort of thing that we expect from Intel chipsets as the passive heatsinks are generally cool to the touch. It took a few hours to run the graphics comparisons and our conclusion was a bit of a wet blanket. The G35 may well support DirectX 10 but it’s a complete irrelevance and from a graphics standpoint the GMA X3500 has made minimal advances over GMA X3000. The significant point of this chipset is the support for 1333MHz processors with DDR 2 memory. On which subject, we suffered a glitch during our PCMark05 testing as the memory figure was rather low in Windows XP. The good news is that Asus has provided both VGA and HDMI outputs along with an HDMI-to-DVI adaptor and this support for dual monitors and HDTV puts G35 head-to-head with Nvidia’s MCP73 chipset if you’re building a Media Centre PC. There’s no denying that Nvidia has a better IGP for gaming but non-gamers won’t give a hoot about that and in every other department the Asus P5E-VM HDMI delivers the goods. 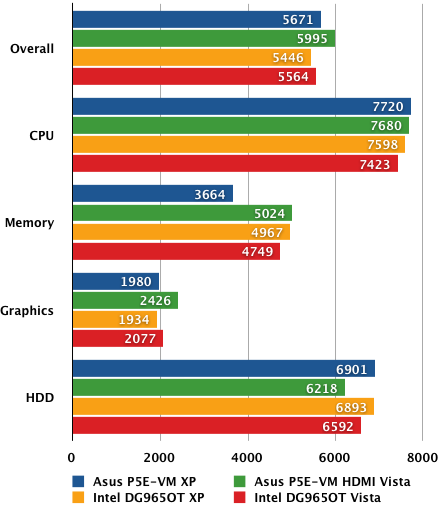 We’re disappointed that Intel didn’t add more graphics grunt to the G35 at the same time that it added the rather irrelevant support for DirectX 10. Asus has used the G35 to produce a tidy motherboard that is packed with features but you pay a hefty price compared, say, to an AMD 690G-based board running an Athlon 64 processor.